My story starts as a freshman in high school. I had just finished my season as an offensive lineman on my High School football team. I had just come off of a great year in which i was a starter. In March of 2010, i was playing european handball in gym. I jumped up for a ball and was knocked down by another student when I fell awkwardly, and felt the infamous "pop." 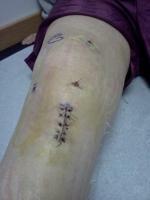 I had surgery six weeks later using a hamstring graft. Six months later, my doctor said i was able to play football again. I came back and was better than ever. Except, my knee would buckle every once in a while with no pain. A month after returning, i was cheap-shotted by a teammate. 2 weeks later i was back in the O.R with the same doctor. This was november 5,2010. In a seven month span i had two reconstructions, this time using a patella graft. The rehab was harder and longer, but i was able to return for my junior year of football. On sept 22,2011, my knee was hit from the side, resulting in immediate pain. I went to the trainer and he said there was laxity. I e-mailed my doctor who said i needed an MRI. The radiology report included degenerative chronic tearing of the acl and a torn medial and lateral meniscus. My doctor said however, that it was an mcl sprain and that i was "not elligible" for this. He said i would be better in a week. It's safe to say i got worse. I then saw another doctor who said that the screws had been improperly placed causing deterioration of the graft. In another 6 months it would be completely torn. I just found this out today and now am heading in for a third reconstruction on the same acl next week. I am writing this because if anyone who is reading this is in a similar position, do not feel that you're the only one. Times may seem tough now, but we will get through them.